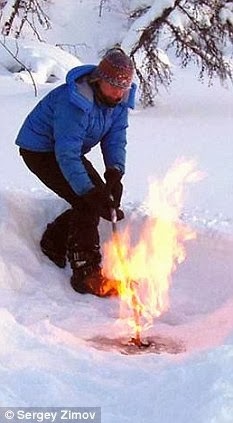 As permafrost melts, it releases methane. The methane exits the permafrost via vents which until recently were small like the one pictured but in the past year have increased in size to hundreds of feet across. Careful when you light a cigarette. Forget the effect of CO2 in the atmosphere on the temperature of the earth. Methane is the gas du jour because it is 26 times as good an insulator as CO2. CO2 is merely a gateway gas that sets us up for methane, the really bad stuff. If you think where you live isn't warm enough, methane is the answer. A little video here. I am providing a link since the blogger can't be embed flash videos. So flare away. Actually, we did need to increase the CO2 in the atmosphere to the point where the Arctic was warm enough to release methane on its own accord. We seem to be there now. Each year promises more melting in the Arctic and further release of methane. So CO2 did its part and can now step into the background. What does this have to do with skinboats? Nothing really other than that their use has very little effect on either CO2 or methane concentrations in the atmosphere. Skinboats, in the current lingo are practically carbon neutral or can be made to be carbon neutral with some effort. On the other hand, using skinboats does nothing to reduce the release of methane into the atmosphere and though it isn't hurting things, it isn't helping either.